Ncell Data Pack have wide variety of Data Packages before you subscribe any Ncell Data Pack, first activate 4G in Ncell to feel the speed of internet. Ncell is the private telecom operator of Nepal has brought many data packs in its latest offer. Just dial *17123# to subscribe to All time Pack, Day Time Pack or Night Time Pack as per your need. You can get 2 times more data in Day Pack and 4 times more data in Night Pack at the same rate. Once the volume in your data pack is over, you can continue to surf internet at Rs. 1/MB (including taxes) for packs of Rs. 100, 150 and 250 and Rs. 3.39/MB (including taxes) for packs of Rs. 10 and 20 till the validity period. After the validity period is over, standard charge as per your tariff will apply unless you buy new pack. It is always recommended to surf Internet by buying Internet pack as you get the best rates. You can update your status, chat, message, upload and share pictures, watch Facebook Videos (and not from Youtube and third party sites) and do everything in Facebook with the Facebook Pack. You can use Facebook pack via official Android and iOS apps and through m.facebook.com in laptop and other devices. Facebook pack is now also available in Opera Mini 4.4 and above. Not only this, if you consume all the data in the Facebook Pack, you can still use Facebook at Rs. 1.12/MB within the pack validity period. Unlimited internet is an Internet Pack where you can get Unlimited Internet for a period of 30 days at fixed cost. 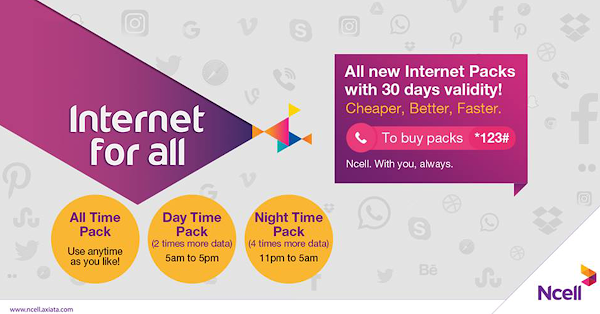 Ncell Data Pack consists of three packs available for Unlimited Internet valid for 30 days from the date of activation. When you are within your pack limit (e.g. within 1GB for Rs. 789.87 Unlimited Internet), you can expect speed of up to 4G depending on your area where you are. Even if you cross your pack limit (over 1 GB for Rs. 789.87 Unlimited Internet), you can still continue to surf at 32 kbps for the rest of the pack validity for free or you can instantly purchase a new pack to enjoy 4G speed again.